When you step into the past at Uogashi Sushi it is also entirely the present, and this is really comforting. The worn wood panelling strikes you as uncannily of the same honey tone as the thickly varnished desks and chairs of your primary school. And here you are in somebody’s workspace and just across the counter, look!, a skilled man is diligently doing what you are not and cannot do, and as you are alone and everything is so focused and silent here, despite the clamour around Asakusa station, you sense deeply he is doing it all for you. Nagasawa-san was hanging out his noren and checking out the street when you walked past and exchanged a glance. He doesn’t smile, you turn back, you are a little hungry, curious, and you check the plastic display, the prices seem all right, the sushi simple, he looks like he knows what he is doing. And when you ask if you may come in and have the 800-yen nami set, then he does smile, and he has those light-up eyes and you feel assured, following him in under the curtain. Sushi is less an art than a craft, a trade. The master executes a sequence of tasks in a prescribed way, learned almost by rote, by muscle memory. He performs a predetermined cut, fold, roll, press, knead or whatever, split-second knife-tip solutions to minor variations in fish or vegetables which are always the same, selected to a budget, and the end result is just what you are expecting, no less no more, which is absolutely perfect right here and right now. How nice for a change to get something personal, made with care, that’s just as you imagined for the price. 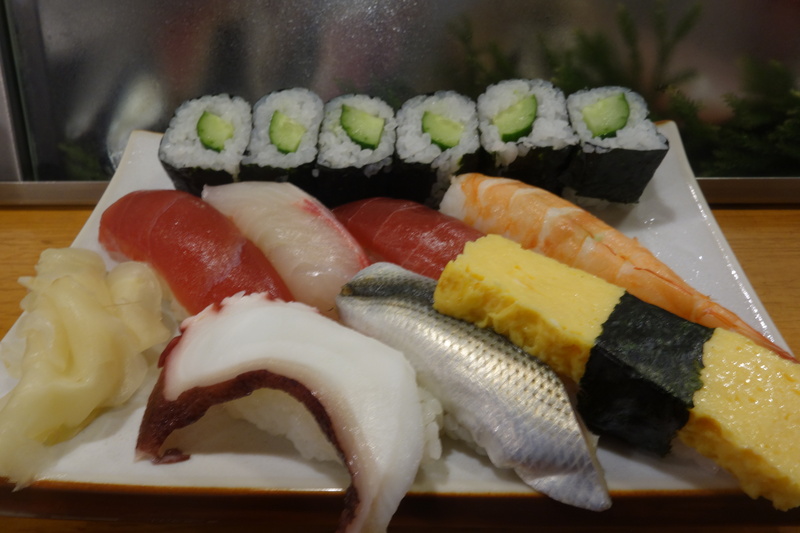 Uogashi Sushi is not expensive, and Nagasawa is a professional. That’s all there is to it; that tells you the sort of sushi you will get here. 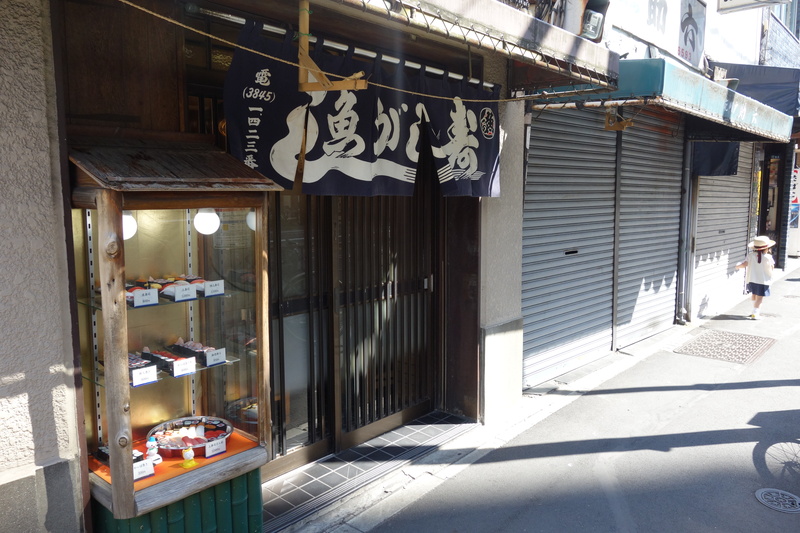 He is also seamlessly fast, and in the lull after you’ve eaten you risk breaking the mood with a little chatter, ask about the expanding tourist trade these days, and he mentions the weak yen. Somehow you turn to the price of cigarettes. You say it’s a good thing you quit. He says yes good for me too. I’ve been quit a long time. There’s a hint of pride as he says this. Ten years ago my father was ill and I was going to visit him in hospital and I went there every day, and you can’t smoke in the hospital, right. So after one day I got home, and I had gone without smoking — I used to smoke 30 or 40 a day — and I thought what if I can manage a few more hours till the morning, and I did. And the next day I had to go to the hospital again and I thought, I’ll see if I can manage it. And I did, and the next day. And it became a week and I thought, it would be a waste to cave in now. And it became a month. I didn’t have one. And then more. And now I never will. Because what it was, was a gift from my father, who died. I can’t throw that away. You say you still feel like one every now and then, and he does too, though he doesn’t like the smell, though he permits smoking after 7pm. Look what I’ve got, he says and shows you the electric fan he’s rigged under the upper shelf above the corner of the counter. It blows horizontally. Like a wall of air, you say. Yes like a protective wall, he says with a laugh. You can sense in his sushi a certain strength and austerity. As you step into the afternoon sun, you feel you’ve re-encountered gratitude.